Subtle title, right? I couldn’t resist, considering that literally all economists and government officials (outside of China, of course) have sounded off on the Chinese Yuan in the last month. Recent additions to this list include President Obama, Chiefs of the IMF and World Bank, President of the Asian Development Bank, US Commerce Secretary Locke and Treasury Secretary Geithner, Nobel Laureate Paul Krugman, ECB Chief Jeane-Claude Trichet, Harvard University Professor Martin Feldstein, Japan’s finance minister…not to mention the thousands of others that didn’t make international news for their denunciation of China’s currency policy. This rhetoric has also been accompanied by several important developments, including a Presidential visit to China, several meeting of the G20, a summit in Singapore, a slight change in the wording of China’s forex strategy, the release of economic data that suggest China’s economy is strengthening, etc. At the same time, their remains an obstinate insistence from every corner of the CCP that despite this pressure, there are no imminent plans to further revalue. Investors are erring on the side of appreciation, however, and futures prices reflect a 3.5% rise in the value of the RMB over the next 12 months. This disconnect is indicative of the fact that there is both a political and an economic side to this issue. When examined exclusively from either side, it looks like pretty cut-and-dried, since economics suggests that a revaluation is both necessary and desirable, but the misalignment of political interests suggests that it won’t be carried out any time soon. Foreign politicians, especially those from the US, have been hammering these points home. President Obama made the RMB a key issue during his visit to China this week. Senator Chris Dodd chimed in with his two cents, that “You can’t give your competitor, your adversary in this case, a 40 percent advantage in global economies.” As analysts pointed out, the US, unfortunately, doesn’t have any leverage on this issue, as it is basically dependent on China to fund its budget deficits through Treasury Purchases. Thus, Chinese Prime Minister Hu JinTao couldn’t even be bothered as to so much mention the RMB when summarized the meeting with Obama for reporters. Other Chinese Ministers rebuffed reporters in separate sessions who even dared to bring up the RMB: “Any policy changes by China, including on the exchange rate, will be based on its assessment of its own interests, not on external pressure.” Meanwhile, “Chinese officials refused to sanction a statement at the Asia Pacific Economic Co-operation summit in Singapore that would have pressed it to adopt ‘market-oriented’ exchange rates for the yuan.” In fact, they have begun to push back against criticism, by arguing that a weak Yuan has actually been economically beneficial. “China keeping a basically stable exchange-rate policy is, in reality, good for the global economic recovery,” argued the Minister of Commerce . This political/economic dichotomy is also evident within China. The Central Bank recently changed some of the language which governs its forex policy; going forward, the Yuan will apparently be tied to a basket of currencies, with its value also influenced by trends in capital flows. However, “The central bank’s position is getting a determined push-back from manufacturers and exporters especially along China’s wealthy coast who stand to reap significant gains in the short term.” Given that the decision to lift the RMB will ultimately be made in the political arena, it’s understandable that the latter group has such a strong bearing on the process. As I indicated above, investors are cautiously optimistic that the government will eventually relent to its critics and allow the currency to resume its steady upward path. 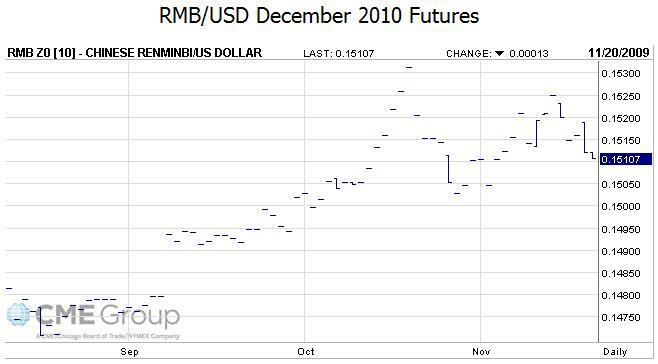 Futures prices have risen steadily since September, when they reflected a flat RMB over the next twelve months. According to one analyst, ” Officials may, starting in the second half of 2010, allow it to recoup the drop of about 10 percent on a trade-weighted basis it’s had since March.” Goldman Sachs, long respected for its economic forecasts, remains one of the lone naysayers, arguing that the Yuan isn’t going anywhere until at least 2011. Personally, my money is an appreciation in the near-term, as soon as the first quarter of 2010. Chinese leaders are stubborn, but they aren’t stupid. It won’t be pressure from the US that will shake them from their moorings – but a further inflation of property and stock market bubbles and concerns over the economy’s unhealthy dependence on exports for growth.